If you have just finished your senior year, congratulations! You made it through high school and are now on to bigger and better things. 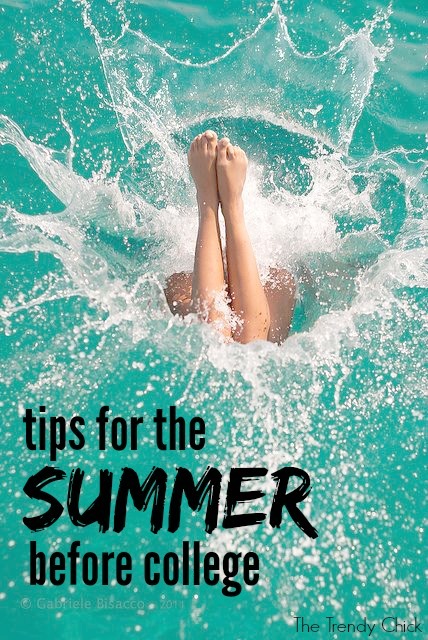 While you might just want to spend the whole summer relaxing by the pool, I am here to share a few productive things you can do to get on the right track for next fall! Every school should have an orientation over the summer so you can get to know future classmates and get acquainted with campus. Even if you live far away, I recommend going because you will get to know your campus better and possibly meet some amazing people! Last summer I wrote an entire post about surviving college orientation, so check that out for even more tips! In addition to binders and pens, you will need to decorate a dorm room as well! You will be buying laundry detergent, rugs, toothpaste, and so much more before your freshman year. I know some people wait until last minute, but I started shopping around in late July to make sure I got everything I needed! At some point this summer you will find out who your future roommate is. I recommend contacting them via social media. My roommate and I connected over Facebook, and clicked immediately. It was great to go into orientation and the first week of college knowing I already had one friend. If you live close to each other, try to get together in person over the summer. If you live farther away, keep in touch through texts and even Skype! Packing will also take quite a bit of time because you are basically packing up your entire life. Start packing a few weeks before you have to leave. I also recommend sorting through everything you own and getting rid of old things you no longer need. Your school will probably offer scholarships, and if you haven't already applied I recommend using your free time to apply to some! You can also apply for outside scholarships over the summer. Once you are a busy and broke college student, you will be very happy you have the extra money. I promise. By the end of the summer you will know what classes you will be in and you will probably have a book list. I recommend buying your books before classes even start so you don't have to stress about that during the first few weeks. Make sure you look around and find the best deal! This could be your last summer with your friends before people start having internships and jobs and not returning. Take advantage of your hometown and make amazing memories with your friends and family! How did you prepare the summer before college? Share in the comments!